Sometimes trips to vineyards and wineries get a little overwhelming. Every appellation in France has its its own set of rules (and a vineyard and winery can cover more than one appellation). Every winemaker has their own method. And, then there’s organic and biodynamic wines which are governed by yet more rules. When we arrived at Château Maucoil, a winery in the Châteauneuf-du-Pape appellation, our host started by explaining that the Château produced both Châteauneuf-du-Pape and Côtes du Rhône. And, that Côtes du Rhône could be produced at three different levels, depending on terroir – Côtes du Rhône is the ‘lowest’, Côtes du Rhône Village the mid-range and Côtes du Rhône Village with the name of the village included the highest quality of Côtes du Rhône. All of this is strictly governed by the appellation. At Château Maucoil the vineyards extended across both Côtes du Rhône and Châteauneuf-du-Pape appellations, so the winery produces both types of wine. North of Avignon on the left bank of the Rhône, the territory of Châteauneuf-du-Pape covers 5 municipalities. Some of the vineyards of Château Maucoil are in Châteauneuf-du-Pape, spread across each of the the three soil types of Châteauneuf-du-Pape: “galets roulés”, gravelly soil and sand. The Côtes du Rhône appellation is much larger, spread over 200km between Vienne and Avignon. And , part of Château Maucoil is in Southern part of the Côtes du Rhône appellation. The soil is clay and limestone mixed with pebble, which makes an excellent soil for growing grapes. All the vineyards of the Southern Rhône benefit from the effect of the Mistral, the strong, cold and northwesterly wind which helps to keep the vines from getting too hot. 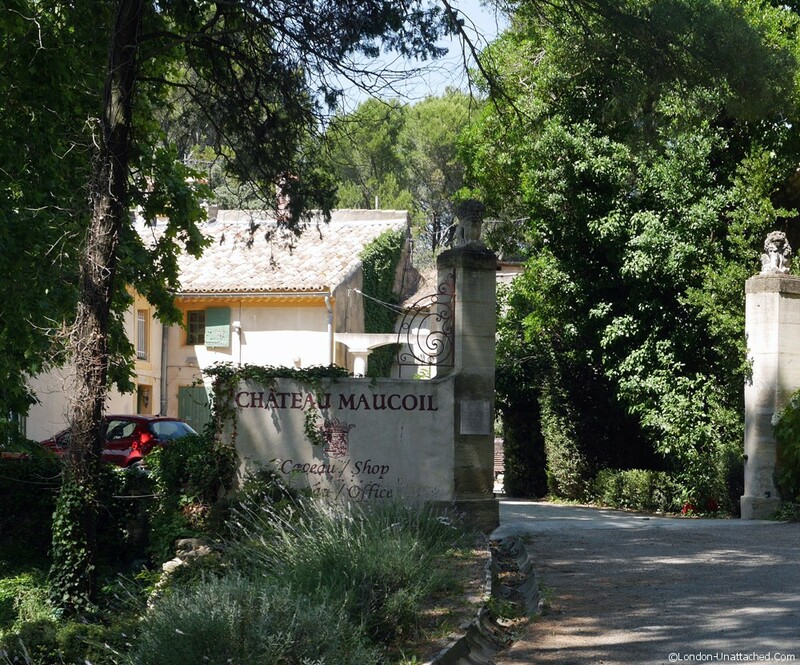 A quick tour of the winery gave us something of an insight into the production at Château Maucoil. They are unique in keeping each field of vines separate through wine production right the way to blending. 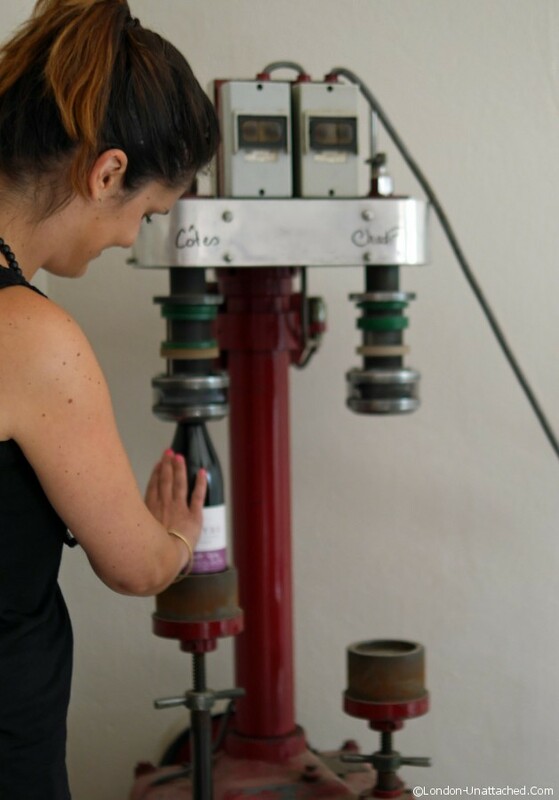 So, tanks, barrels and barriques are labelled carefully and it’s the job of the wine maker to decide how to blend the wine in order to produce the perfect Châteauneuf-du-Pape or or Côtes du Rhône wine. By the time I’d finished our ‘hands on’ blending session, it was easy to see how this could potentially improve the end product. 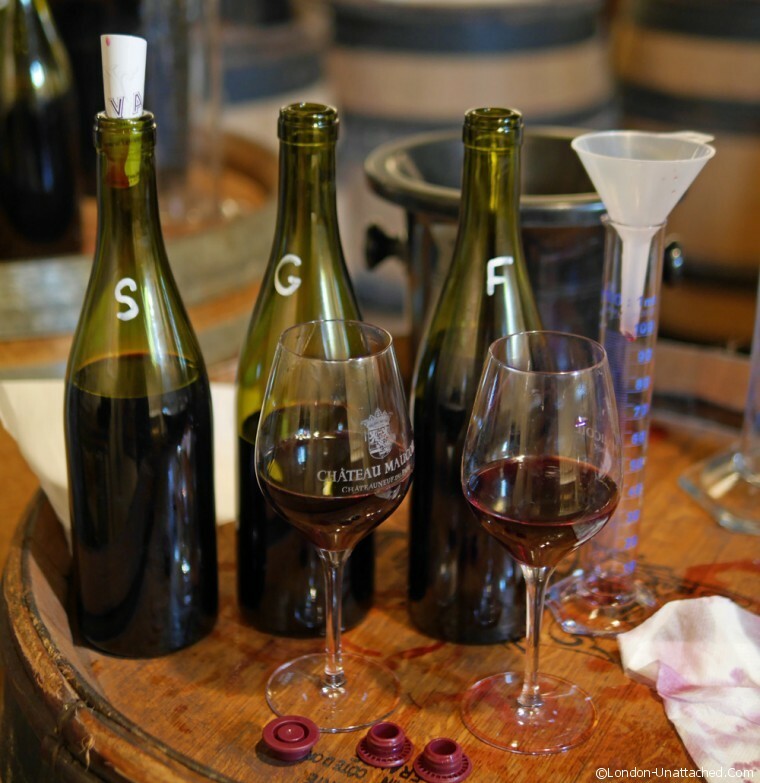 Most of the red wines of Côtes du Rhône are based on two well known grapes, Grenache and Syrah, with the possibility of adding a number of other regional varieties such as mourvèdre. 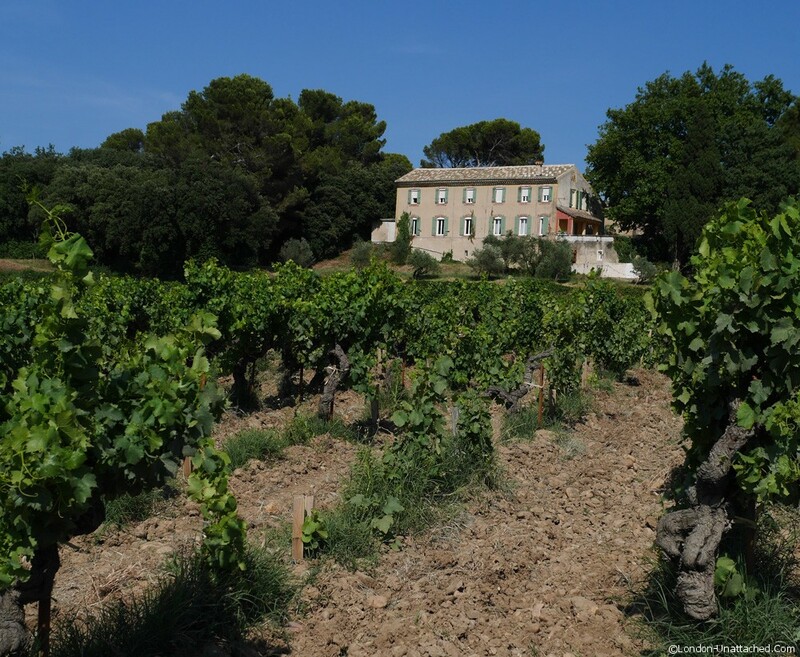 But, to meet the requirements of the appellation, Côtes du Rhône Village has to have a minimum of 40% grenache And, the use of oaked wines is again something which is at the discretion of the wine maker. 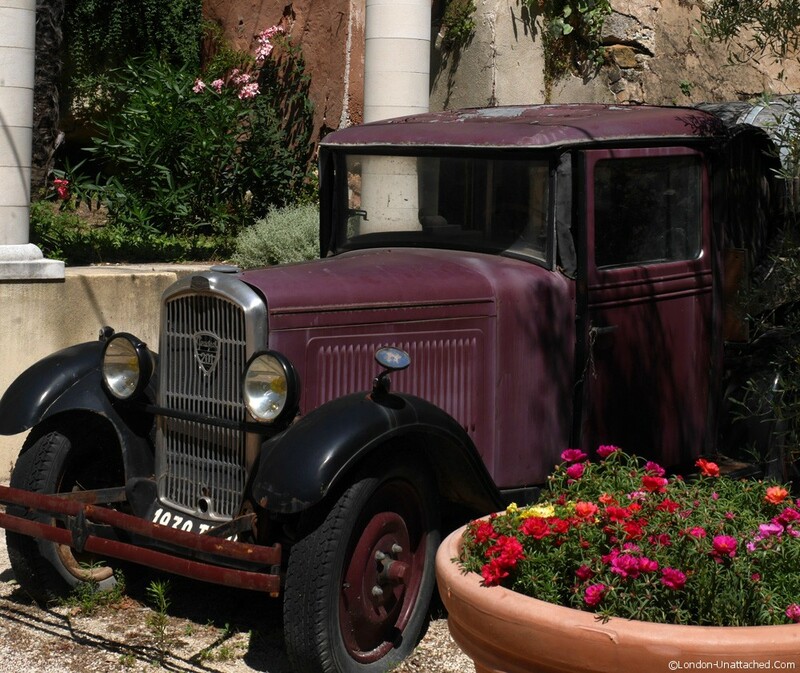 Châteauneuf-du-Pape is generally based on a blend of the same grape varieties, though famously, the appellation includes 14 allowed grapes and the blend is at the discretion of the wine maker – it’s the very tightly defined terroir that governs who can make Châteauneuf-du-Pape. 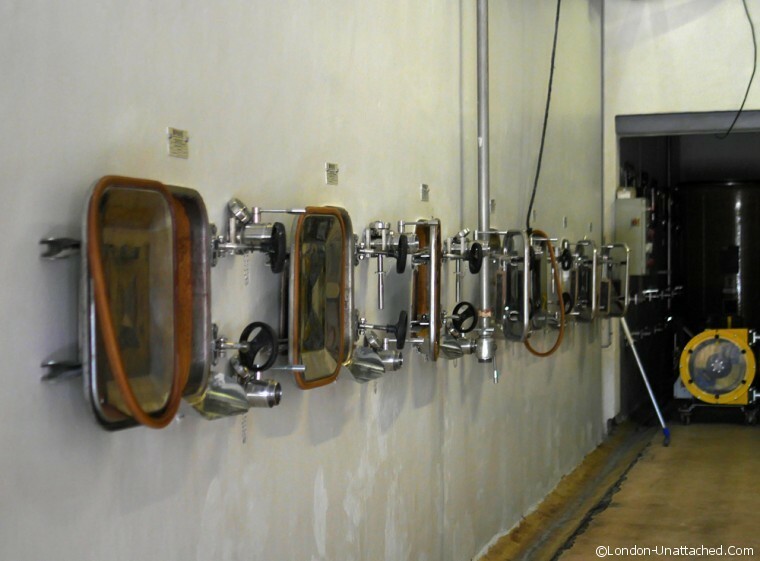 We were ushered into a large room with barrel-tables already set up for what looked like some kind of strange scientific experiment. Test-tubes and teat-pipettes, huge jars of wine and several glasses. I had a strange feeling things might get just a little out of hand quite quickly. In fact we were given three different wines on which to base our blend. Grenache and Syrah were joined by what our guide called ‘fûts’ (it’s short for élevé en fûts de chêne) a blend of oaked wines, if you like the fairy dust to add at the end! 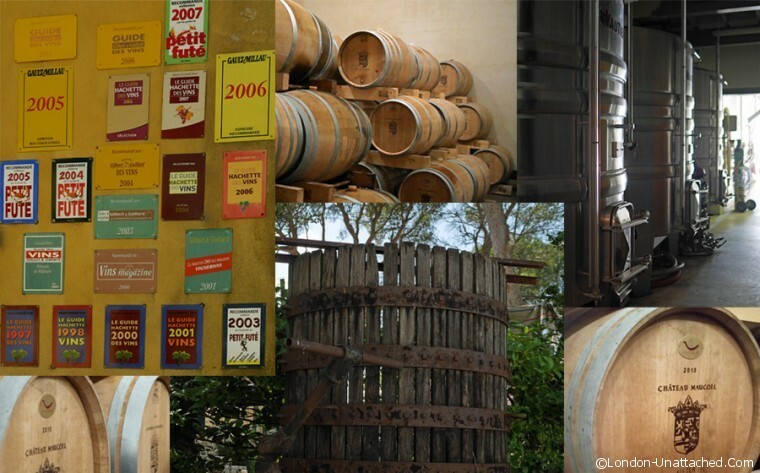 Oaked wines are not so common in this part of France because the extreme heat and the dependence on Grenache means that the wine can easily oxidise if it is stored in small barrels. 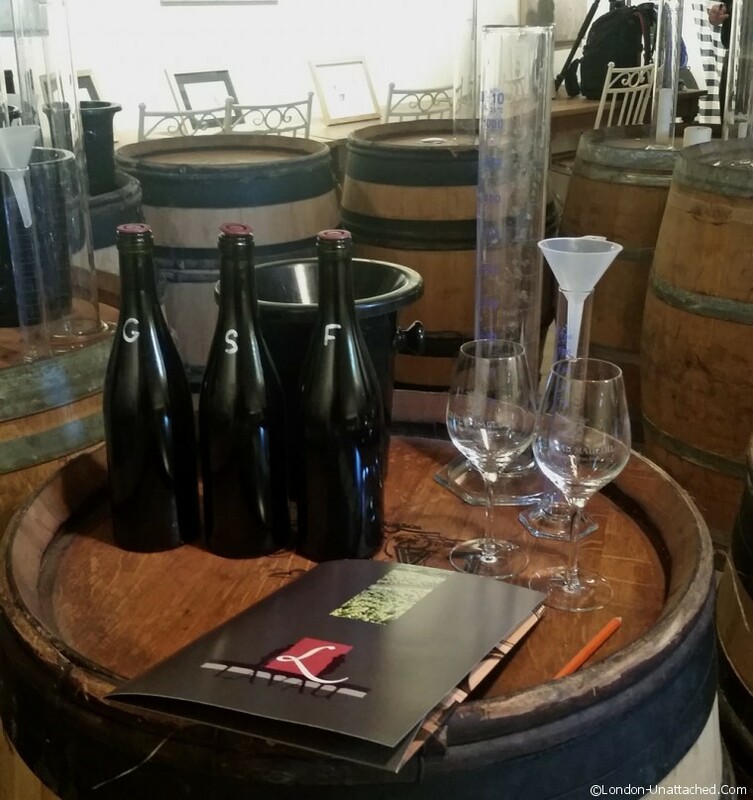 For the most part the Grenache is vinified in large cement tanks and the other grape varieties in large old barrels called foudres which don’t add oak in the same way as smaller barrels. First of all we tasted the single variety wines. The Grenache was the strongest – a fruity red wine that was high in alcohol. The Syrah a deep purple wine, was softer and more acidic. Then we started experimenting. We mixed away, starting with at least 40% Grenache to start. I tried a blend of 40% Grenache, 40% Syrah and 20% Fut. It was far too light for my palate, so I kept going, working my way up with three more blends before I produced what was, for me, the perfect mix. 80% Grenache, 15% Syrah and just 5% Fut – a lightly oaked, robust and fruity wine that I was very happy to discover was going to be bottled up for me to take home! We didn’t get a chance to pasturise our wine, so we were told it would need to be used within 2-3 weeks. Not that I had any problem with that – I think mine went within a week of getting back to the UK. A splendidly entertaining way to pass an afternoon, this was also an excellent way to get an introduction to the nuances of the wines in the region. Tasting as you blend does make you very aware of the contribution each grape variety adds to the final product and, personal taste is also challenged. It’s very easy to start thinking that perhaps you’ve got something wrong when your neighbour’s prefered blend is different. Well worth a visit if you are in the Rhône Valley. 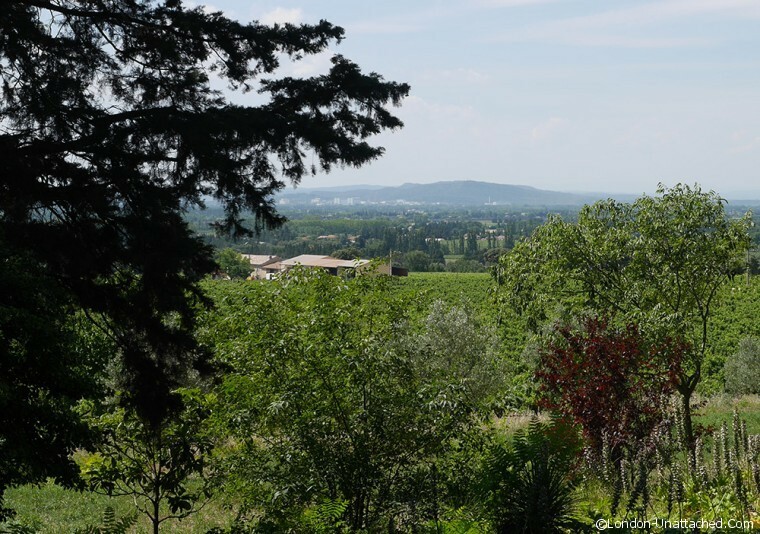 More information about the wines of the area and the three regions can be found through Jessica from Inter-Rhône – a tourist organisation providing specialist wine information for the Rhône Valley. Getting to blend wines and tasting them along the way sounds really awesome. I’m jealous. Makes me want to go learn more about wine. I love visiting wineries when I travel. Looks like you really got a close look at the production and had a wonderful sampling experience. Doesn’t it give you a much better appreciation for the masters who do all of the blending? Quite an art. What a great experience. I love seeing the production and how it gets to the vineyard to my glass! Oh, we would so love to do this! When we get back to France (we were there this last April), we should go to the Rhone Valley and look to do this! Interesting experience. Not a big fan of wines myself but always enjoy seeing and reading about how they are produced. Cheers! The grape-growing/wine-making process is so fascinating; especially how it varies all over the world. What a neat experience to take part in the mixing of wines. I would feel as if I were back in a high school Chemistry class! Will definitely look into this experience. Thanks for sharing.